Hughes and Salvidge have taken the lead on Health and Safety at Heathrow Airport by becoming the first demolition contractor to insist on using SiteZone Proximity Warning System on all projects that involve plant and on-ground personnel. All plant that we are using at Heathrow Airport has been fitted with SiteZone RFID (radio frequency identification) detectors, while site workers have RFID transponders fitted to their hard hats. When a site worker breaches the dangerous proximity zone of a vehicle, both the worker and driver receive a ‘proximity warning’. The RFID tag vibrates, making the site worker aware of the vehicle, while the driver is alerted by sound and flashing lights in the cab of the vehicle. This two way system ensures that safety is never compromised. 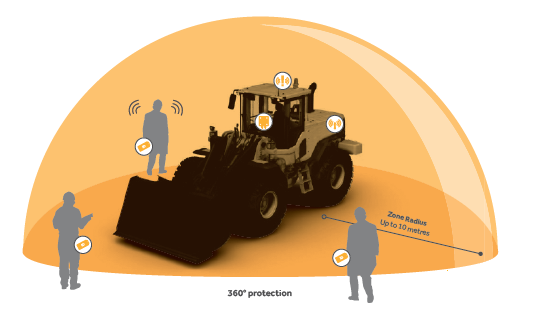 The SiteZone Proximity Warning System has already received excellent feedback from our plant operators and on-ground personnel, and our clients are delighted with our use of this safety system on their projects. SiteZone can also log incident data for analysis, enabling targeted training and continual improvement in safety on sites where plant and on-ground personnel operate side-by-side. Hughes and Salvidge will use this excellent safety system alongside our other rigid Health and Safety measures.